Much like Abbott’s previous novel, Dare Me this book explores the world of teenage girls, but this time instead of cheerleading, it’s the cutthroat world of gymnastics. I’ve always been totally intrigued by gymnastics, though it’s nothing I’ve ever attempted myself, and though I thought I knew just how brutal this industry can be, You Will Know Me was an real eye opener for me. Katie and Eric’s daughter, Devon is the rare type of gymnast that only comes along once in awhile. She could be an Olympian one day and her parents have dedicated their entire lives to ensure her success. Things are told from Katie’s point of view, which is a bit different for Abbott, but for the most part I liked this approach. The strain and pressure that Devon is under to be such an elite athlete is crazy, but her parents are bearing the weight of the world on their shoulders as well. There is a heavy financial strain, countless hours lost driving to practice and meets, fellow parents that are intense and jealous, and the worst part of all (for me at least) is that Devon’s younger brother, Drew is pretty much forgotten about. My favorite part of this book was the look into this insane world. The families at the gym Devon is a part of were morbidly fascinating. Everyone is very close, it’s a tight knit community, but at the same time everyone is uber competitive. You have families that are literally sacrificing everything for their daughters, at any and every expense you can dream of. When someone closely related to the gym is killed, things ramp up even more and the tension is palpable. The mystery aspect here didn’t work so great for me, I found it a tad predictable. Had I not been so caught up by the gymnastics, I probably would’ve been more disappointed.I wasn’t very satisfied by the ending either, and as a whole I would’ve liked to see a little more depth in the characters, maybe this is due to everything being told from Katie’s perspective, I’m not sure. I wasn’t a big fan of the majority of the characters either, Devon especially was so cold, she always had a laser like focus even when she was at home and school. I had a huge soft spot for poor little Drew though. 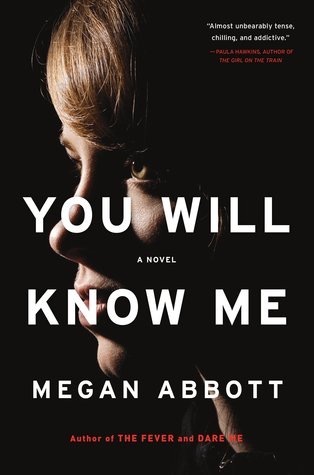 Abbott’s writing style is razor sharp and intense and there was an underlying sense of dread throughout, which undoubtedly made me give her a pass for a so so “twist”. If you’re already a fan of Abbott’s then you’ll enjoy this I think. Or if you want to read a very dark book about the competitive world of gymnastics, give this a try. But if you want a surprising mystery, this isn’t it. Thanks to Little and Brown for my review copy. Yeah it wasn’t anything amazing, good call on the pass. I read Dare Me and I didn’t like it, maybe I wasn’t feeling it, I don’t know… But everyone seems to love this author so I don’t know. It was so weird and dark… but in a different way from what I used to read. I wanted to try her books again to see if maybe it was just me that day, but I don’t think this will be it! Dare Me was the first one of hers I read and I remember thinking that it wasn’t as good as I expected it to be. I thought I would give her another chance, but after this one I’ll probably pass in the future. All of that to say, skip this one then. Fab review, Amy! 🙂 I love watching gymnastics during the Olympics. I tried it out when I was younger and was horrible at it. Lol Too bad this one didn’t work for you as far as predictability goes. I can’t stand when I’m reading a mystery or thriller and I can see the twist coming a mile away. Thanks Jill! Yeah, that’s exactly what happened her, disappointing!